Hyperviscosity syndrome (HVS) is a rare manifestation of rheumatoid arthritis with few reported cases. Although plasmapheresis is effective as the first line treatment in life threatening manifestations such as pulmonary hypertension, stroke, retinal hemorrhages and congestive heart failure, data on effective maintenance immunosuppressive therapy is lacking. HVS is characterized by abnormal immunoglobulin production. Rituximab is a powerful B cell depleting therapy which can theoretically eliminate pathogenic B cells and decrease immunoglobulin production in HVS. We report two cases of rheumatoid HVS who presented with either severe pulmonary arterial hypertension or post-partum cardiomyopathy. The case of pulmonary arterial hypertension was treated with two cycles of plasmapheresis followed by rituximab 1000 mg IV separated by 2 weeks and repeat dosing every 6 months. The second case was a post-partum cardiomyopathy which presented with inflammatory polyarthritis and compensated congestive heart failure. She was treated with prednisone followed by rituximab infusion. As far as we know, these are the first two cases of rheumatoid HVS which have been treated with rituximab. Hyperviscosity syndrome (HVS) is a rare extra-articular manifestation of rheumatoid arthritis with only 22 cases reported in literature [1-19]. The hallmark of HVS is polyclonal hypergammaglobulinemia associated with elevated serum viscosity leading to impairment of end organ perfusion [15,16]. Patients usually present with non-specific symptoms such as epistaxis, bleeding gums, headaches, confusion, blurry vision, abdominal pain, fatigue, dyspnea, palmar erythema and stroke [2,5-15,17-19]. Congestive heart failure is uncommon in rheumatoid HVS . Only two cases of pulmonary arterial hypertension (PAH) leading to right heart failure have been reported [6,7]. Although the first line of treatment of HVSfrom any cause is plasmapheresis, there are no studies to guide maintenance therapy. Therapy that targets pathogenic B lymphocytes in rheumatoid HVS has not been reported previously. Rituximab is a mouse:human chimeric IgG1 anti-CD20 antibody which has been approved for treatment of rheumatoid arthritis by the United States Food and Drug Administration based on a large multicenter, randomized, double-blind, placebo-controlled study . Rituximab depletes B-cell precursors and mature B cells which express CD20, a cell surface protein, by binding to CD20 and increasing complement-dependent cytotoxicity, inducing antibody-dependent cell-mediated cytotoxicity by binding Fcy receptor on surface of effector immune cells, and by inducing non-classical apoptosis of B cells by crosslinking of multiple CD20 molecules [22,23]. The effectiveness of rituximab in B-cell depletion has been reported in other autoimmune diseases associated with immunoglobulin overproduction such as IgG4-related disease . In plasma cell dyscrasias, serum viscosity of 4-5cp, which corresponds to a serum IgM level of at least 3 g/dL, an IgG level of 4 g/dL, or an IgA level of 6 g/dL, has been associated with development of symptoms . This study was a prospective non-comparative clinical case series. We reviewed charts of two cases of rheumatoid HVS. The two cases met the American College of Rheumatology criteria for rheumatoid arthritis. Both patients were African American females. Figure 1 shows the serum protein electrophoresis at diagnosis of hyperviscosity syndrome for case 1 (Figure 1A) and case 2 (Figure 1B). Gamma globulins were higher in case 1 than in case 2 which was paralleled by the plasma viscosity. Plasma viscosity was highest at presentation which was 8.4 for case 1 and 4.3 for case 2. Both cases had positive rheumatoid factor and cyclic citrullinated peptide antibodies. Immunoglobulins G, A and M were elevated in both cases and both cases were negative for cryoglobulins. Paraprotein was not detected in either cases. Figure 1. Densitometer tracing of protein electrophoresis of patients’ serum. Anode is to the left. A represents case 1 and B represents case 2. A 45 year-old African American female with seropositive rheumatoid arthritis (RA) for 8 years presented with intractable nausea, headaches, and dizziness to Emory University hospital in December, 2013. She had been diagnosed with pulmonary arterial hypertension (PAH) 6 weeks earlier, and was referred to our center for PAH evaluation. Six weeks prior to presenting at our center, a transthoracic echo (TTE) showed normal left ventricular ejection fraction (LVEF) (60-65%) but the right ventricular systolic pressure (RVSP) was 38 mmHg. By right heart catheterization (RHC), the mean pulmonary arterial pressure (mPAP) was 38 mmHg (normal 8-20 mmHg). She failed treatment with tadalafil due to severe headaches. She experienced progressive shortness of breath which culminated into persistent headaches, dizziness and bilateral chest pain. At her presentation, she had been on abatacept monthly infusions for 2 months with good control of joint swelling, and had previously failed methotrexate and etanercept. She denied history of tobacco or alcohol use. Review of systems was positive for fatigue and paresthesias of the hands but was negative for fevers, night sweats, weight loss, orthopnea, paroxysmal nocturnal dyspnea, history of deep veinous thrombosis or pulmonary embolus, joint pain/swelling, inflammatory rashes and Raynaud’s phenomenon. Her vital signs were significant for tachycardia (pulse 108), tachypnea (respiratory rate 22) on 3 liters/minute oxygen by nasal canula with oxygen saturation of 99%. On physical examination, she was in mild respiratory distress. The lungs were clear to auscultation. Cardiac auscultation revealed tachycardia, pronounced P2 with jugular venous distention to the bilateral ears. Abdomen was soft without organomegaly. She did not have deformities or synovitis of the wrists, metacarpophalangeal and proximal interphalangial joints. There were no rashes, all cranial nerves were intact and there were no focal motor deficits. Laboratory findings were significant for hemoglobin of 9.5 g/dL, mean corpuscular volume 94, platelets 124,000/microliter, alanine aminotransferase (ALT) 69 units/L, aspartate aminotransferase (AST) 105 units/L, total serum protein 11 g/dL, albumin 2.4 g/dL, sodium 130 mmol/L, prothrombin time of 16 seconds (normal range 10.4-13.1), partial thromboplastin time 42.6 seconds (normal 25-39 seconds) and d-dimer of 874 ng/mL (normal < 500 ng/mL). HIV, Hepatitis B surface antigen, surface and core antibodies, and hepatitis C antibodies were negative. Serum protein electrophoresis is shown on Figure 1 and urine protein electrophoresis was negative for paraproteins. Immunoglobolin quantitation showed elevated immunoglobulins A, G and M (Table 1). Her serum viscosity was 8.4 cp. TTE revealed LVEF of 70%, severely dilated right atrium and right ventricle and a RVSP of 42 mmHg. RHC showed mPAP of 33 mmHg (normal 8-20 mmHg) and pulmonary wedge capillary pressure (PCWP) of 7 mmHg (normal 4-12 mmHg). Computed tomography pulmonary embolism protocol was negative for pulmonary embolus. She was admitted to the intensive care unit for epoprostenol infusion. We diagnosed her with PAH secondary to rheumatoid HVS for which she underwent two cycles of plasmapheresis with normalization of serum viscosity. She developed a catheter tip clot and intravascular catheter staphylococcal infection which was treated with vancomycin. She was also started on anticoagulation. She progressively improved and was discharged home on epoprostenol infusion which was later changed to inhaled tyvaso and chronic anticoagulation with warfarin. Although her dyspnea remained stable, serum viscosity progressively rose and rituximab infusion 1000 mg on day 1 and day 15 was initiated a month after diagnosis. Rituximab infusion was repeated every six months which controlled both joint swelling and kept serum viscosity below 4 cp (Figure 2A). A year later, she denied dyspnea and repeat TTE showed a normal right ventricular systolic pressure (29.5 mmHg). She continues to follow closely with the pulmonary hypertension clinic. She is maintained on inhaled tyvaso nine breaths four times a day and chronic anticoagulation. Figure 2. 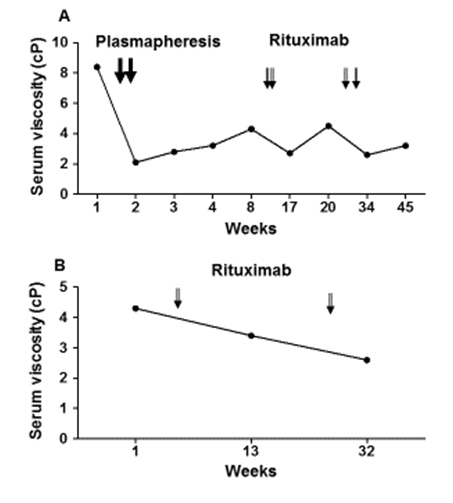 Serum viscosity response to rituximab infusion over time. A 39 year-old African American female with history of post-partum cardiomyopathy since age 34 (ejection fraction of 10%) presented to the rheumatology clinic with morning stiffness for more than 2 hours, swelling and pain in the bilateral wrists, metacarpophalangeal joints and left third proximal interphalangeal joint for 3 weeks. She denied alopecia, dry eyes, dry mouth, Raynaud’s phenomenon, red painful eyes, oral or nasal ulcers, shortness of breath, orthopnea and chest pain. At presentation, she was afebrile and normotensive but her heart rate was 112 beats per minute. Lungs were clear to auscultation but she was tachycardic and with presence of an S4. There was no lower extremity edema or jugular veinous distention. She had synovitis of bilateral wrists, metacarpophalangeal joints and left third proximal interphalangeal joint. Laboratory findings were significant for hemoglobin of 8.9 gm/dL, mean corpuscular volume 85.8fL, ALT 34 units/L, AST 147 units/L, total serum protein 10.4 g/dL, albumin 2.7 g/dL. Serum protein electrophoresis showed polyclonal hypergammaglobulinemia without paraproteins (Figure 1B). 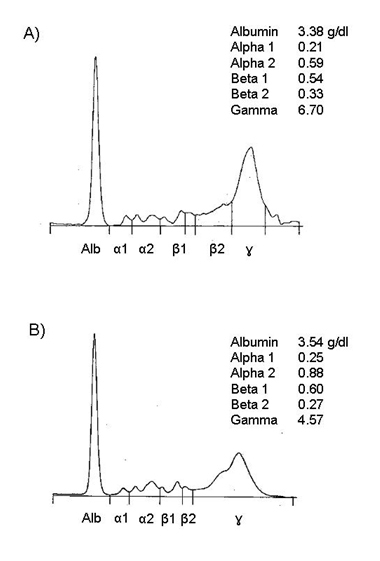 Immunoglobulin quantitation showed elevated immunoglobulins A, G and M (Table 1). Rheumatoid factor was very elevated (Table 1). Serum viscosity was also found to be elevated at 4.3 cp. She was subsequently diagnosed with rheumatoid HVS. Hepatitis B surface antigen, surface antibody, core antibody and hepatitis C antibodies were negative. Hand x-rays showed non-specific swelling in the left third middle finger proximal interphalangeal joint but there were no erosions. A transthoracic echo from two years ago showed left ventricular ejection fraction was 10% with severely enlarged left ventricular cavity. She was treated with prednisone 5 mg by mouth twice daily for a month and then rituximab infusion 1000 mg was given but she missed her next rituximab infusion scheduled on day 15. Her serum viscosity decreased to 3.4 cp two months later (Figure 3B). Six months later, she had repeat rituxan 1000 mg infusion on day 1 but she had an allergic reaction on her day 15 rituxan infusion. Therefore, rituxan infusion was discontinued. Rheumatoid HVS presenting as PAH can be life threatening. Two previously reported cases of PAH in patients with rheumatoid HVS [6,7] were treated successfully with plasmapheresis. Our case with PAH was also treated with two sessions of plasma exchange with a drastic drop in serum viscosity from 8.4 cp to 2.3 cp. Patient also reported subjective improvement in dyspnea and her oxygen requirement decreased from 2 liters/minute to room air. However, without any additional immunosuppression, serum viscosity gradually increased as dyspnea slightly worsened. Following rituximab infusion, serum viscosity again remained below 4 cp most of the time (Figure 2A). In the two previously reported cases of PAH in rheumatoid HVS, methotrexate was used in one case  while prednisone taper was used in the other (starting at 30 mg by mouth daily) . Our patient had failed both Enbrel and methotrexate. The presence of polyclonal hypergammaglobulinemia pointed to a pathogenic B cell driven overproduction of immunoglobulins. Indeed, hypergammaglobulinemia progressed during treatment with a T cell targeting agent, abatacept. Thus, rituximab was chosen as it has been shown to decrease immunoglobulin production . We ruled out other causes of pulmonary hypertension including pulmonary embolism with CT of the chest and left heart failure using a TTE. Although the onset of gradual worsening dyspnea coincided with the initiation of therapy with abatacept, literature search did not find any association between abatacept and PAH. It is important to note that this patient did not have any synovitis at presentation. There are no previous case reports of rheumatoid HVS and post-partum cardiomyopathy. Although patient was diagnosed with post-partum cardiomyopathy 5 years before diagnosis of rheumatoid arthritis, it is important to note that rheumatoid HVS can theoretically exacerbate congestive heart failure. Although most patients with rheumatoid HVS usually have over 5 years of rheumatoid arthritis, there has been a report of rheumatoid HVS diagnosed at initial diagnosis of rheumatoid arthritis . This patient had very high rheumatoid factor titer and was also antinuclear antibody positive. High titer rheumatoid factor is an important risk factor for developing HVS and requirement for maintenance immunosuppression as patients with rheumatoid HVS tend to have high RF and most required immunosuppression . Because our case with post-partum cardiomyopathy had very high titer rheumatoid factor and increased serum viscosity which puts her at high risk for developing complications of HVS, we initiated therapy with rituximab to target the pathogenic immunoglobulin production. She did not need plasmapheresis as there was no cardiopulmonary decompensation. Despite missing day 15 of both cycles of rituximab infusion (Figure 2B), her serum viscosity remained below the symptomatic limit of 4 cp (Figure 2B). Although flow cytometry was not obtained for both of these patients, polyclonal hypergammaglobulinemia resolved after 6 months of rituximab infusion and rheumatoid factor decreased by 50% after 3 months of rituximab infusion for case 2. We also saw lymphopenia within 4 weeks of rituximab infusion which was sustained for at least 3 months in case 2. The first case also saw sustained lymphopenia for at least three months of rituximab infusion. These data are consistent with lymphocyte depletion by rituximab and subsequent decrease in immunoglobulin production. It is well established that rituximab depletes B cells by inducing antibody-dependent cell-mediated cytotoxicity upon binding Fcy receptor on the surface of effector immune cells, inducing non-classical apoptosis of B cells by crosslinking of multiple CD20 molecules, and mediating complement-dependent cytotoxicity [22,23]. Rituximab ability to decrease CD4+ T cells in rheumatoid arthritis has been associated with clinical response . A possible mechanism of rituximab depletion of CD4+ T cells may be by inhibiting an activation pathway of CD4+ cells initiated by the antigen presenting function of B cells or by inhibiting stimulation of CD4+ cell proliferation after priming by dendritic cells . These two cases suggest that rituximab may be a reasonable choice for the treatment of rheumatoid HVS complicated by cardiac manifestations. In addition, rheumatoid HVS can present in patients with well controlled joint disease. Although most patients with rheumatoid HVS have at least 5 years of rheumatoid arthritis, rheumatoid HVS has been reported at the initial diagnosis of rheumatoid arthritis. Thus, it is important for rheumatologists to be aware of this syndrome in order to treat appropriately. Hollingsworth JW (1968) Serum hyperviscosity syndrome. In. Edited by Arthritis LaSCoR. Philadelphia: Saunders; 96-99. ©2015 Aluoch AO. This is an open-access article distributed under the terms of the Creative Commons Attribution License, which permits unrestricted use, distribution, and reproduction in any medium, provided the original author and source are credited. Department of Medicine, Division of Rheumatology, Emory University, 1365 Clifton Rd. NE Building A, 4th Floor Atlanta, GA 30322, Tel: 404-778-4366; Fax: 404-778-3217.